Don’t expect dry socket to go away on its own. You should contact your oral surgeon in Houston and allow them to take a look at your mouth. Standard treatment involves washing out the socket with a saline solution that removes food particles and bacteria buildup. Then, they can use a special dressing (which will need to be replaced after a few days) to protect the socket and soothe the affected area. Pain medications might also be prescribed. If you diligently follow your surgeon’s orders for caring for the area, you can expect to recover from dry socket in about 7 – 10 days. Avoid straws. The suction can disturb the blood clot. Do not smoke or use tobacco. If you inhale smoke too quickly, the air movement can dislodge the blood clot. The chemicals in tobacco products may also slow down healing. Eat soft food. For at least a day after your surgery, you should stick to eating soft foods, like soup, yogurt, and applesauce. Follow your surgeon’s instructions for oral hygiene. You may have to wait a day or so before you resume brushing your teeth. When you do start brushing, be extremely carefully around the extraction site. Dry socket is a serious and painful condition. If you suspect you have it, contact your dentist or oral surgeon right away so you can receive treatment and get back on the road to a healthy smile. Dr. Steve L. Koo is a Diplomate of the American Board of Oral & Maxillofacial Surgery. He has served residents of the Houston community for many years. 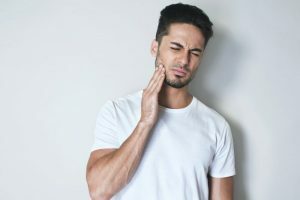 If you believe you need to have your wisdom teeth extracted, or you have questions about dry socket, you can contact Dr. Koo and the rest of our team at 713-783-5560.
by: Dr. Steve Koo at December 5, 2018 .